Measure and analyze your Webs.com site traffic. AddFreeStats is a free traffic analysis tool. It helps webmasters to improve their website and understand why they have or hadn’t had success with their website content. With AddFreeStats web traffic metrics solution, you will know who is visiting your website, how your readers found your website, what they read and what they search for. AddFreeStats tool is easy to install on your webs.com website. 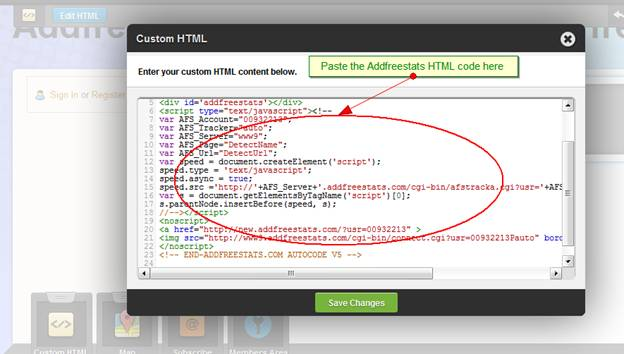 Here is an easy step by step instruction guide on how to install AddFreeStats tracking code into your webs.com site. 1)	Create your account on Addfreestats to get a unique tracking code for your webs site. 3)	Now log into your Webs account as usual and click on the button labeled "Edit this site". This should be the site where Addfreestats code should be inserted. 4)	Next, click on the "Builder" button that is on top of the page. 5)	Now click on the button labeled "Other" on the navigation bar and then click on “Custom HTML”. 6)After this, click on the HTML module and drag it to the window on the right. 8)	After pasting the Addfreestats tracking code. Finish the process by saving the changes using the "Save changes" button below the box. Addfreestats tracking code has been successfully integrated to your Webs.com site and should start functioning fully. To access the details and web analysis instantly you can click on the Addfreestats button that appears on your Webs site. In another way, you can access to your free website statistics to login on AddFreeStat.